I would love to tell you all about Chantelle. She looks like someone with a story. Unfortunately her lack of English and my lack of French and Khmer mean our communication is very limited. But what I can tell you is that she has a beautiful, warm personality and a bubbly persona. She laughs a lot. She is delighted when customers arrive at the tiny restaurant set up on the front porch of her home. She is even more delighted when customers can speak French. Her whole face lights up. 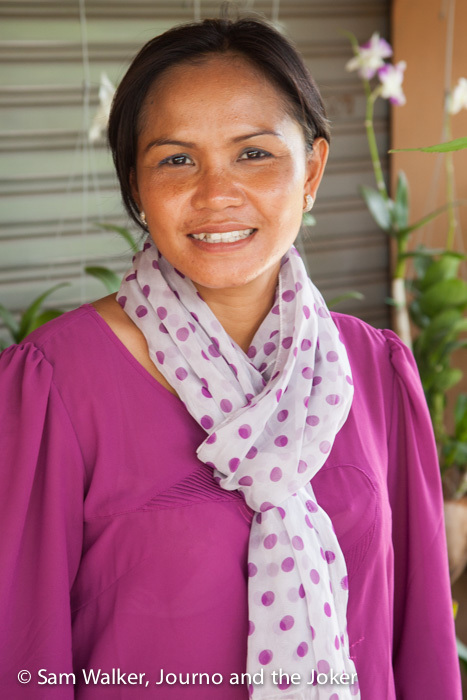 Chantelle lives in a village about 20 kilometres west of Siem Reap. Her restaurant is spotless. The menu is not expansive but she does an amazing fried rice with egg. She said rice with omelette but it came out with a runny fried egg instead. She has made it previously with omelette but I don’t know how to express the difference with our language barriers. The first time I ate here was with a group of people and she also made a beautiful big bowl of fresh green salad, the likes of which are hard to find in Cambodia. The second time I had a communication mishap, asking for a citron juice, thinking I would get a fresh lemon or lime juice. Alas, it was a canned concoction, not really juice at all. Her restaurant is called Juliette’s. I’ve been told it is named after her daughter. I haven’t been able to confirm for myself. I’ve also been told her father was a French professor, which accounts for her fluency in French. Chantelle also runs a lovely nursery. Her garden is essentially a mass of potted plants in many shades of green, specked with vibrant colours. 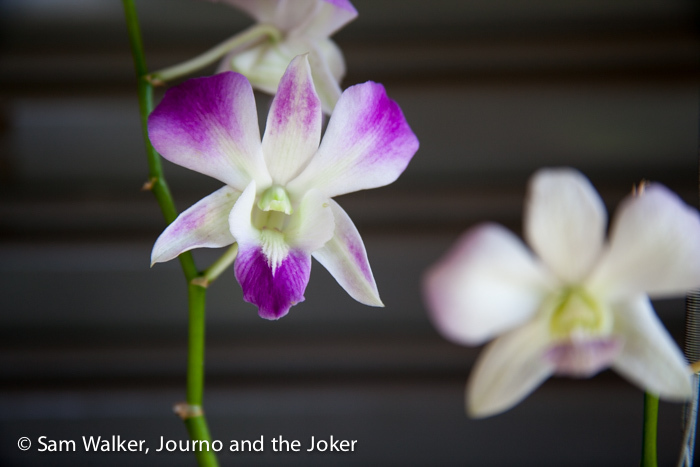 You will find many herbs as well as heliconias, frangipanis, palms and orchids, among others. It is a lovely surrounding for a meal. 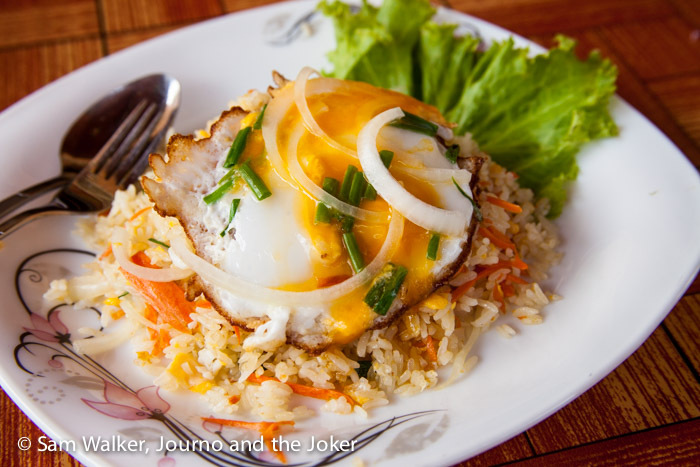 And the price is hard to beat – $1 for a plate of fried rice and an egg. We went for a cruise along the country roads surrounding Chantelle’s and the landscape was stunning. Little red roads and tracks, winding through lime green fields of rice. 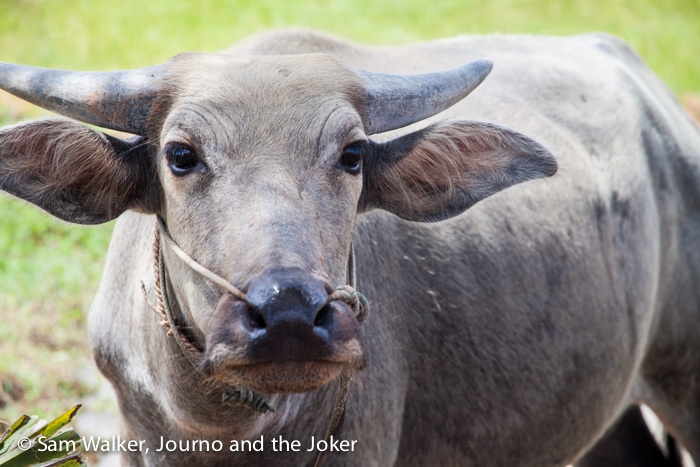 Dark brown wooden Khmer houses raised high and cows and buffalo along the roads and wallowing in shallow water. I love getting out into the countryside and sometimes attempting to overcome the language barrier is half the fun and adventure. I love how you tell stories about people on your blog! It’s so fascinating to hear about people from all over the world. Hallo Ruthie. Thanks for having a read. I love that you love our stories. I wish I had the time to produce more because there are just so many to tell!